Technology is all around us. Technological innovations are non-stop and being connected is as fast and easy as a finger snap. Because of the rise of technology, experts say that printing is going to be out of the marketing track, and companies all over the world are hurriedly pushing through a “Digital First” approach in their marketing strategies. Although these perceptions hold a truth in some sense, print ads will continue to be a thriving marketing material. Before you switch to an all-digital branding approach, below are reasons why you should keep print in your marketing strategy. Emails took the internet by storm and have since been part of people’s daily lives. This soon gave way to Email marketing, which has become a popular, cost-efficient alternative to print ads. It seemed very efficient at first, consuming less space and costing less money to companies, however, consumers started to be overwhelmed with the amount of marketing junk they receive via email on a daily basis. Because of this, emails were hardly even opened and sometimes even go straight away to people’s spam or trash bin without even being clicked open. Email marketing became less and less efficient and personal and even goes hardly noticed by the busy skimming eyes of consumers. While things online, such as emails, can be easily ignored and scanned, print out materials stay longer in a person’s hand and is given more time and attention- long enough to digest the information that’s being presented. This is one of the basic characteristics of print that is nearly impossible in email marketing. When your print material stands out and is giving valuable content to your readers or consumers, it is easy to breakthrough their scanning eyes of familiarity. You can easily build emotional connection through strong texts or images, playful tweaks of color using psychology and science, and even by the quality of paper being used. The number of ideas being presented and the overall appeal of your print ads will definitely close the deal and make your customers even want to know you more. Digital marketing also changes on a daily basis and because of its very dynamic environment, relevance is always a challenge to consider. You may become viral now but you’ll only get archived later. Digital marketing is a dog-eat-dog industry and being relevant at all times is a daily battle marketers face regularly. This is why print still continues to be a royalty in the marketing industry. Print may not be a king like it used to be a century ago, but it can evolve and can become a powerful tool in advertising that may be more efficient and effective than emails or any digital ads for that matter. Surveys also show that direct mails receive greater response rate compared to emails- over 5 percent compared to 0.6 percent of emails. On a survey done in the last quarter of 2017, almost 60 percent of marketing emails are unwanted and this only shows that consumers are no longer interested or enthusiastic about marketing emails from companies. Direct mails, on the other hand, offers one-to-one customization that feels more personal to the receiver. It is the exact opposite of emails– cold, generic, and impersonal in nature. This capability of print ads supports time effective, cost-efficient, relevant, and timely campaigns. According to the US Postal Service, 81 percent of direct mail receivers prefer to scan or read direct mails every day. Also, the Direct Marketing Association further validated the fact through a survey they conducted showing that 65 percent of the consumers prefer to purchase through direct mail advertising. According to the statistics presented through an infographic from Print-Print (2015), over 50 percent of consumers pay attention to print ads, over 70 percent feel at ease reading it and prefer to read information through a paper than in a computer/gadget. Also, over 80 percent of consumers agree that information stays better and longer when they read it in print ads and that companies only switched to digital to save money and not for their consumers’ convenience. Aside from the above-mentioned benefits of using print ads, consumers also associate printed information as legitimate and credible compared to emails that appear almost every second. Consumers know the risks of clicking the wrong ads, including viruses or malware infecting their devices, or worse, leaked information. Since printed ads take more delivery time and effort, and offer minimal to zero risks to their personal information, they are generally given more time and attention. Print ads open more doors to companies by incorporating them to other medium or marketing material, and as mentioned earlier, print ads connect to more human senses so the feel, smell, quality, and look of the print ads instantly creates an emotional connection with consumers. Digital Marketing and print must go together. With the right mix of both print and digital marketing on your branding strategies, customer interaction and engagement is going to increase. Although it’s quite difficult to fathom how print and digital can work together, several marketing geniuses have tried the two following approaches in their branding strategies. 1. QR codes on print ads. QR codes can be scanned by the consumer and when connected to the web, they will be lead to a certain website to access valuable information. QR codes can also be used for promotional discounts and the like. 2. Printed business cards are easy to collect while digital business cards are easy to share. Both of them contribute positively to a company’s overall branding. Print marketing continues to rock the world of advertising, making it hard for a sign company to completely migrate to the online platform. 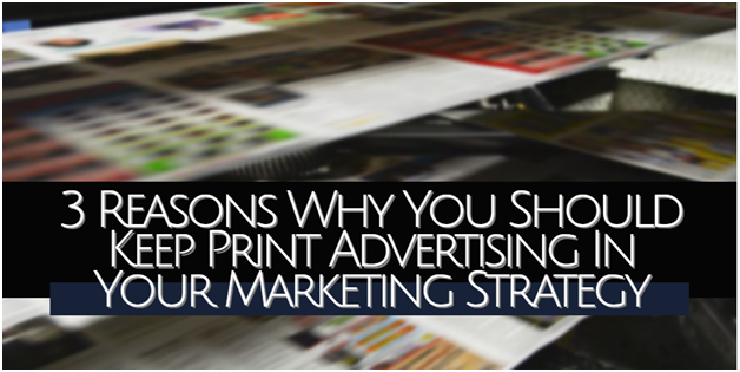 If your digital marketing isn’t working, it may need a kick of print marketing. Print advertisers who have grown in the advertising industry know the best way to connect with your audience through a tangible paper. Most print advertisers also offer sustainable, affordable, and full service marketing solutions for all your marketing needs. Ella Flores, of Saber Sign Solutions, loves writing anything informational and entertaining. From business-related articles to fictional pieces, name it all. She pursued her passion in writing as a content marketer in the field of print advertising.